Those who grew up in the LDS faith probably also remember participating in the Primary Program. Each child in the ward would be given a part to read. My mother would help us practice at home. The older kids had longer parts, and we would sit on her floor and look in her mirror and practice. I'm pretty sure we even put the Step exercise equipment on a coffee table, and pretended it was a podium as our siblings sat on the couches in the "congregation". After years of participating and practicing, I only remember one thing: it was what my tender brother Racer said. Racer, maybe five years old, with his dark hair combed to the side and his shirt probably untucked from khaki pants, stepped onto the little stool they put behind the podium for children, put his mouth close to the microphone, and yelled. At the time, it seemed that he had made an error. I, as well as the many around me, giggled out of amusement and embarrassment for him. Now, I'm humbled to tears. Those three words hold high significance. He lives again! He is risen! Why not shout them from the pulpits as a sweet child once did? We have a Savior. He loves us enough to have suffered through all. "[He] was wounded for our transgressions, he was bruised for our iniquities: the chastisement of our peace was upon him; and with his stripes we are healed." (Mosiah 14:5, Isaiah 53:5) He allowed himself to be mocked, beaten, and spit upon, suffering more than I could bear, simply so that you and I could become perfect through His sacrifice. After nails had been pierced through His hands, wrists, and feet, He hung on the cross. He had lived His life selflessly serving, healing, and feeding His sheep. He then died selflessly, for me. It's hard for me to imagine this. It's hard for me to imagine that someone so perfect could give up His life for someone so selfish and imperfect as me. But He did. He did it for you as well. People have maybe wondered why members of the LDS faith do not wear crosses like other Christians tend to do. It is not because we don't believe in Christ or because we don't believe in his Atonement. We most definitely do. The reason why we do not have crosses on our church buildings is because of the following three words: HE LIVES AGAIN! What a beautiful message! 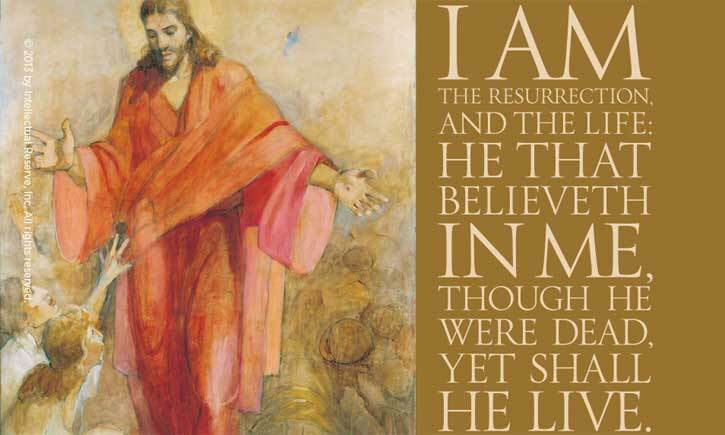 Christ, our Savior, our Lord and Redeemer, lives! Such words make me feel warm, bright, and peaceful. As our beloved Prophet, President Thomas S. Monson said, "The most glorious, comforting, and reassuring of all events of human history had taken place—the victory over death. The pain and agony of Gethsemane and Calvary had been wiped away. The salvation of mankind had been secured. The Fall of Adam had been reclaimed." (He is Risen!, April 2010) Because of His sacrifice, we too can live. Thank you, Cebre. There is a story behind why Racer knew that part so well. We used to read the Val Chadwick Bagley board book, "My Little Book about Jesus" often. Near the end of the book, if you remember, there were pages that were darker that showed a picture of Jesus on the cross on the hill. The picture and words were kind of scary and said, "Not everyone loved Jesus. Evil men killed him. But He didn't stop helping us." As soon as we turned the page, though, the picture was of springtime and the open tomb and Jesus standing there talking to Mary. In the middle of several sentences, it said, "He taught His friends that He lives again." I think Racer was so happy to see it change to joy and happiness that he would always shout out, "He lives again!" when I got to that part. It was so precious. Like you and your memory of the Primary Program, I'll never forget how much joy he felt when I turned that page.